So what is the point of having a TRPG Maker and what exactly is it? A few years year ago a bunch of people decided to make a tabletop roleplaying-like game of their own. We wanted to be free of predesigned games, wanted to create something new. And the people started from scratch. Literally… We actually started designing cards using much-liked tools like Paint. No pun intended. So we came to the conclusion that we needed something with which our highly skilled card designers could work. 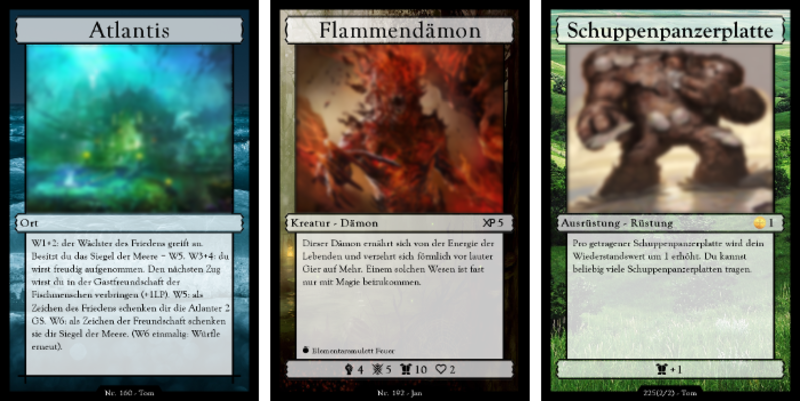 We needed something that allowed us to input text an which creates printable gaming cards. Hence TRPG Generator or Tabletop Role Playing Game Generator. You think of a card, a creature, a location or whatever you want to have in your game. You think of a nice little description and some values to interact with. You throw a picture of it onto the generator and define the background. That’s it. Do that 900 more times and you have a game. Design a map, or decide not to use a map. Your choice. Now you have a tool to create a game without the need of an actual designer. Build a game, have fun, review the rules, discuss, correct the cards or start over. Even collaborate on the same project.